Federal Officials Indict More Than 40 People Linked to White Supremacist Prison Gang The Ghost Face Gangsters started in California but a Georgia offshoot has spread criminal activity far beyond prison walls. On Monday, 43 were charged with drug trafficking and firearms possession. On Monday, 43 alleged associates of the Ghost Face Gangsters were indicted on federal charges related to drug trafficking and firearms possessions throughout eastern Georgia and beyond. Federal officials have indicted more than 40 people linked to the Ghost Face Gangsters, a violent white supremacist street gang operated largely from inside Georgia prisons. The charges against 43 men and women — related to drug trafficking and firearms possession — stem from Operation Vanilla Gorilla, one of the largest takedowns of Ghost Face Gangsters associates to date, the U.S. Attorney's Office for the Southern District of Georgia said in a statement on Monday. "When I was sworn in as the United States Attorney, I pledged that we would make neighborhoods safer and work hard to dismantle criminal street gangs," said U.S. Attorney Bobby Christine. "As this indictment demonstrates, we will coordinate with federal, state and local law enforcement to identify criminal organizations; we will target them; we will dismantle them," Christine said, adding that the gang started in prison but has "spread to the free world." "It is my goal to end the gang where it started," he said. The indictment alleges that the narcotics-trafficking conspiracy began as early as 2015 and is still ongoing. It follows the March arrest and indictment of 23 members accused of racketeering, wire fraud, drug trafficking, carjacking, kidnapping, maiming and murder, among other crimes. The latest charges include 25 counts alleging the possession of controlled substances with intent to distribute, 25 counts alleging prohibited persons — drug users and felons — in possession of firearms or ammunition and 18 counts alleging the unlawful distribution of controlled substances. "The Ghost Face Gangsters gang is very violent and their members will not hesitate to shoot at anyone," Byung Jin "BJay" Pak, the U.S. Attorney of the Northern District said after the March indictment. The criminal group, which has now swelled to more than 2,200 members, originated in California in the 1970s, Barry Paschal a spokesman for the attorney general's office told NPR. The Georgia offshoot was founded in the Cobb County jail sometime between the late 1990s and early 2000s, but it has since spilled out onto streets and neighborhoods throughout Georgia and beyond. 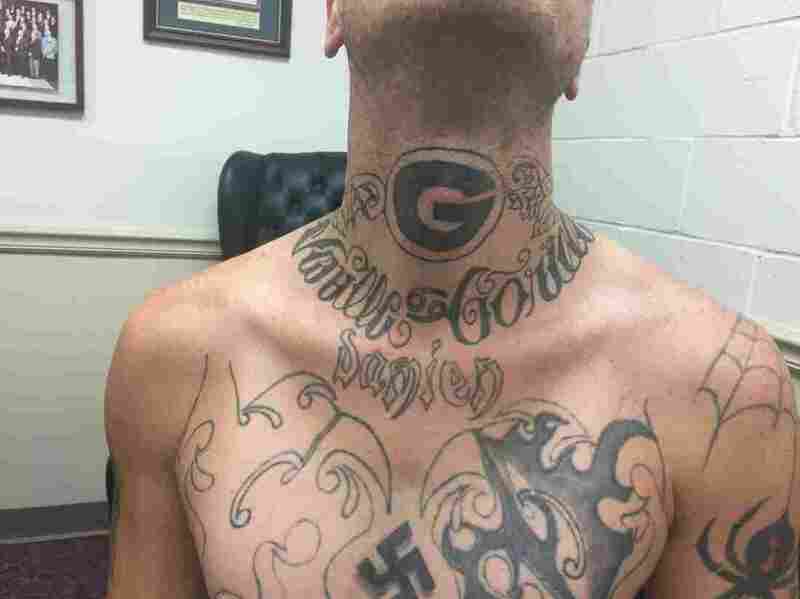 The Anti-Defamation League includes the Ghost Face Gangsters among three Georgia-based white supremacist prison gangs. However, the organization notes "only some members of the group are white supremacists." "It's more that these folks have more of an emphasis on doing business than the typical white supremacist activities," Paschal told NPR, clarifying that members of the gang are exclusively white. "They're not out burning crosses on people's lawns. They're out selling methamphetamines, cocaine, heroin and pills." As of Monday, 41 of the men and women identified in the indictment are in custody. "A lot of these people were already were incarcerated because they are already in prison," Paschal told NPR. Law enforcement officials continue to search for the remaining two suspects. "This organization distributed dangerous drugs (methamphetamine and heroin) that caused immeasurable damage to communities in the Southern District of Georgia," said Robert Murphy, the Special Agent in Charge of the Drug Enforcement Administration Atlanta Field Office. One alleged member was arrested after a baby's body was found stuffed in a freezer, and when police found him in Florida, he took a man hostage and was shot four times by a SWAT team, McClatchy previously reported. The gang has been linked to the killing of two Georgia correctional officers after two inmates killed their guards and escaped a work bus in June of 2017, the Macon Telegraph reported. They were later captured. According to their criminal histories, the defendants have 561 arrests between them. Four of the defendants have more than 10 felony convictions each. If convicted, the defendants could face life sentences in prison.